There is one ingredient that goes with practically everything in Russian cuisine. Fortunately it’s easy to make. 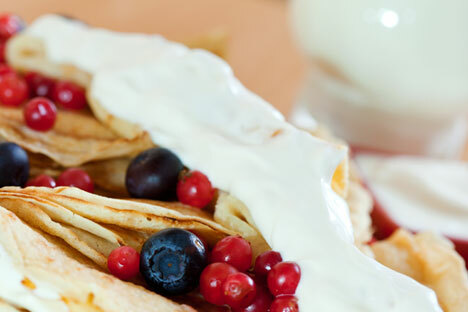 Sour cream, or smetana in Russian, is one of the key ingredients in Russian cuisine. In Russia, practically everything is served with sour cream – soups, pancakes, salads, bread, potatoes, vareniki (dumplings) and even desserts. It’s everywhere! But it isn’t only sour cream that gets our affection. Russians love most anything in the dairy family. Russian supermarkets have a huge selection of dairy products – and especially dairy drinks – that can’t be translated into English and that most non-Russians find pretty strange. However, these are the things that Russians can’t live without and always miss when traveling abroad for a long time. Sour cream even has a place in Russian literature. Both Nikolai Gogol and Leo Tolstoy made sure to include sour cream on the table in their descriptions of feasts, and a character from a beloved children’s book famously said: “I love my grandmother… and sour cream!” It’s clear that Russians’ love for sour cream starts early. And I’m fairly sure that the country’s obsession with this fermented dairy product started early in its history, too. Russia is a country that doesn’t have many sources of natural vitamins, so it was important to find a way to use every nutritious product available. Russians learned early on to preserve root vegetables by pickling and berries by turning them into jam. I imagine it didn’t take long for early Russians to discover ways of using fermented milk – if you make sour cream from it, you can also make cottage cheese from the same batch and also use the remaining liquid to use as an ingredient to make pancakes. Sour cream is very easy to make, although it’s best to use unpasteurized milk or cream. Put four cups of full-fat milk or cream in a glass jar. Add a spoon of yogurt or some yogurt bacteria. Cover with a cheesecloth, and leave in a warm place overnight. The next morning, If you started with milk, you can skim the top layer off – and there’s your sour cream. If you were using cream, the whole quantity will have turned into sour cream. It will keep in the refrigerator for two or three days. Boil some potatoes, put sour cream, salt and some fresh herbs on top and Priyatnogo appetita!